This morning AMD decided to provide an update on its CPU core/SoC roadmap, particularly as it pertains to the ARM side of the business. AMD already committed to releasing a 28nm 8-core Cortex A57 based Opteron SoC this year. That particular SoC is aimed at the enterprise exclusively and doesn't ship with an on-die GPU. Next year, AMD will release a low-power 20nm Cortex A57 based SoC with integrated Graphics Core Next GPU. The big news? 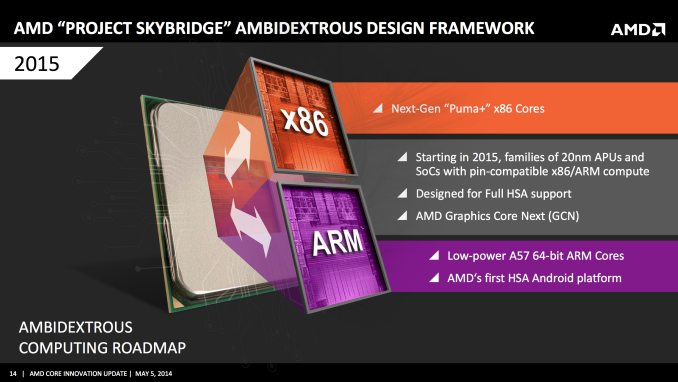 The 20nm ARM based SoC will be pin compatible with AMD's next-generation low power x86 SoC (using Puma+ cores). The ARM SoC will also be AMD's first official Android platform. I don't expect we'll see standard socketed desktop boards that are compatible with both ARM and x86 SoCs, but a pin compatible design will have some benefits for embedded, BGA solutions. AMD expects to target embedded and client markets with these designs, not servers. AMD's motivation behind offering both ARM and x86 designs is pretty simple. 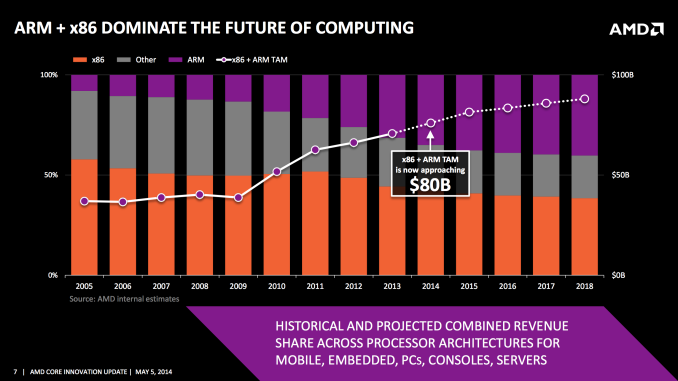 The TAM (Total Addressable Market) for x86 is decreasing, while it's increasing for ARM. 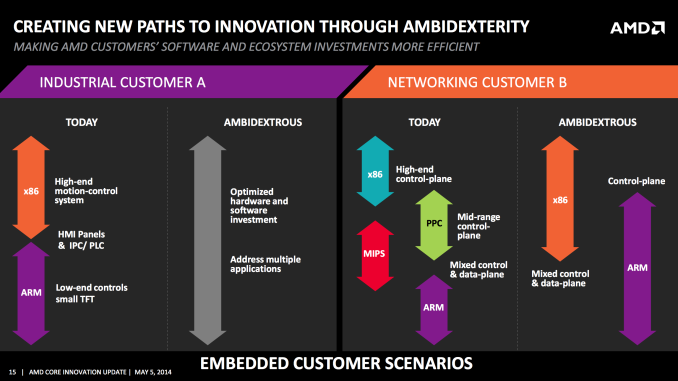 AMD is no longer married to x86 exclusively and by offering OEMs pin compatible x86/ARM solutions it gets to play in both markets, as well as benefit if one increases at the expense of the other. Note that we're still talking about mobile phone/tablet class CPU cores here (Cortex A57/Puma+). AMD has yet to talk about what it wants to do at the high end, but I suspect there's a strategy there as well. "AMD hasn't produced a single interesting processor in years."